Known as “America’s Finest City”, San Diego offers a wide array of things to do and see for visitors of all ages. 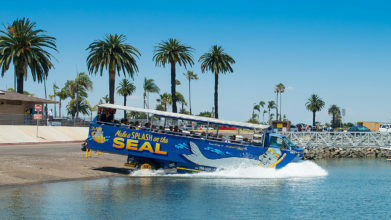 Let Old Town Trolley show you California’s second largest city, where blue skies, exciting attractions and 70 miles of beaches come together to create a vacationer’s paradise. For over 25 years, Old Town Trolley Tours has been providing sightseeing tours highlighting the best San Diego attractions. Hop aboard one of our trolleys and you’ll experience Transportainment, a delightful combination of transportation and entertainment. The Attraction that takes you to the attractions, Old Town Trolley Tours is the best way to see the city, highlighting the best of San Diego. Purchase tickets online or at our ticket depots. You will board the trolley at our harbor ticket booth just a short walking distance from the cruise ship terminal. We provide a tour that’s just under two hours with hop on and off privileges at 10 different stops that covers 25 miles of San Diego and Coronado. Guests are responsible for returning to the ship on time before the ship departs. Adults must have both ship’s card (which usually doubles as your room key) and a valid photo identification (passport, driver’s license, etc). Purchase tickets through your cruise ship, either online prior to departure or through the shore excursions desk onboard the ship. Guests are met by our Trolley representative on the pier and escorted to their private trolley to begin their tour. We provide a 1 1/2 hour chartered tour that covers 25 miles of San Diego and Coronado. Your trolley tour will return you to your starting point at the cruise ship terminal. Some of our trolleys are accessible. We request a 48-hour advance notice for our accessible guests. For more information call (866) 754-0966. Need a place to store your baggage while taking our tour? Baggage Nanny is a luggage – baggage storage company. Baggage Nanny will come pick up your luggage from where you are, store it, then drop it off at the airport, or at a predetermined location and time. If you just arrived in San Diego and need somewhere to store your luggage to take a Trolley tour, or until you check-in at your hotel, Baggage Nanny can do that as well. All Old Town Trolley guests receive a 10% discount by using the coupon code BAGGAGE. Guests can book this service through their website at baggagenanny.com.